Best snap on a pair of rubber gloves because this is going to be a messy delve into an Anarchic Academic Admixture of Settled Science Spaghetti and Historic Hubris that’s liberally coated with Consensus Calibration Coulis. This Anarchic Academic Admixture is very much alive and in a seething state of continuous change as it wriggles towards an illusive Consensus. This continuous change isn’t always appreciated. I don’t personally understand the reason why calibration has been re-calibrated recently (back in 2013) as it must cause a lot of confusion when dating archaeological material. For example, the 2300BC scenario is now dated to around 2500BC, opening up a massive gap in archaeology. What is worse, if you have a few books on the shelves that are written in the old dates – they are now invalid. But it’s a great job creation scheme as all those old books and articles are conscientiously consigned to the memory hole so they can be replaced with copious quantities of fresh Consensus Compliant Chaff. However, for independent observers, it’s becoming increasingly difficult to differentiate this process of continuous change from a Settled Science Stampede that’s locked into a feedback loop that’s going round in circles [and getting nowhere meaningful]. Positive feedback is a process that occurs in a feedback loop in which the effects of a small disturbance on a system include an increase in the magnitude of the perturbation. Taking a closer look at one of these carefully crafted globs of Consensus Compliant Chaff may help illustrate the point. The Late Antique Little Ice Age was a long-lasting Northern hemisphere cooling period in the 6th and 7th century AD, proposed as theory in 2015, and subsequently confirmed as the interval from 536 to about 660 AD. 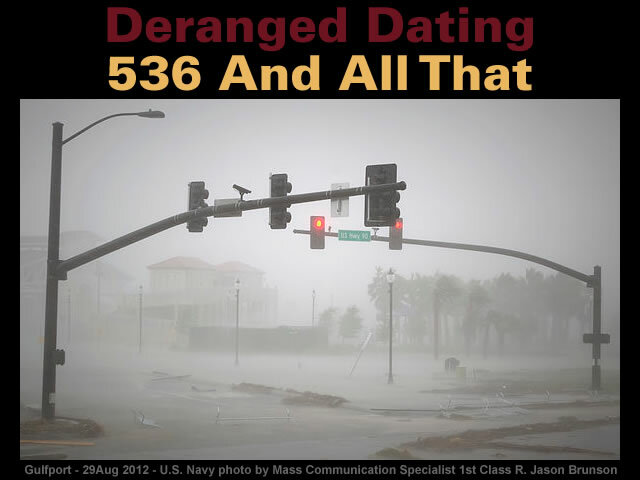 One of the supporting strands of Settled Science Spaghetti embedded within this glob of Consensus Compliant Chaff focusses upon the “extreme weather events of 535–536”. This period followed three immense volcanic eruptions in 536, 540 and 547. One of the suspected volcanic sites for those events is the Rabaul caldera, in the western Pacific, which erupted around 540. The extreme weather events of 535–536 were the early phenomena of the century-long global temperature decline. The first hunk of Historic Hubris is centred upon my old friend Procopius who is [unfortunately] one of the best Western mainstream sources with the least convincing provenance. The Byzantine historian Procopius recorded of 536, in his report on the wars with the Vandals, “during this year a most dread portent took place. For the sun gave forth its light without brightness… and it seemed exceedingly like the sun in eclipse, for the beams it shed were not clear”. Furthermore, Procopius of Caesarea [“the last major historian of the ancient Western world”] is one of the best Western mainstream sources with the least convincing provenance and [ironically] “the worst” content. For example, his “celebrated (and infamous) Secret History” was lost for over a thousand years before it was [apparently] “discovered” in the Vatican Library and published in 1623. The second hunk of Historic Hubris comes from the Emerald Isle. Unfortunately, these sources are also rather dubious. The Annals of Ulster was compiled [at least] 900 years after the events of 536 AD. The Annals of Ulster are annals of medieval Ireland. The entries span the years from AD 431 to AD 1540. The entries up to AD 1489 were compiled in the late 15th century by the scribe Ruaidhrí Ó Luinín, under his patron Cathal Óg Mac Maghnusa on the island of Belle Isle on Lough Erne in the province of Ulster. Cathal Óg Mac Maghnusa (1439-1498) was an Irish historian. He was the principal compiler of the Annals of Ulster, along with the scribe Ruaidhrí Ó Luinín. The provenance of the Annals of Inisfallen includes lots of arm waving and wishful thinking which fails to obscure the uncomfortable truth that the manuscript can only be traced back to a vague “some time” before the end of the first quarter of the seventeenth century. The Annals of Inisfallen are a chronicle of the medieval history of Ireland. There are more than 2,500 entries spanning the years between 433 and 1450. The manuscript is thought to have been compiled in 1092, as the chronicle is written by a single scribe down to that point but updated by many different hands thereafter. From the beginning to 1092.5, the MS is the work of a single hand, perhaps that of Diarmait Ó Flainn Chua, bishop and lector of Emly and abbot (r. 1092-1114), or Mael Ísu Ó hArrachtáin, abbot of 17 Emly (died 1092). The MS was continued to the early fourteenth century by some 18 scribes (only six of whom made large contributions). Mac Niocaill, however, suggests that while the earliest stratum may be associated with Emly, the annals may have been continued at Tomgraney, transcribed at Killaloe after the mid-eleventh century, and continued at Lismore from about the year 1119. The MS passed to a West-Munster monastery, most likely Inisfallen, in 1130×1159. There are lacunae 1130-59, 1214-6, 1285-95. The fact that much of the later part of these annals is in phonetic spellings lends them an additional linguistic interest. The MS came into the possession of Sir James Ware (died 1666) some time before the end of the first quarter of the seventeenth century and is described in the catalogue of his books as ‘Annales coenobii Innisfallensis in agro Kerriano. Sir James Ware (1594 – 1666) was an Anglo-Irish historian. Knighted in 1629, Sir James was elected Member of the Irish House of Commons (M.P.) for the University of Dublin in 1634. In 1638 he, with Sir Philip Perceval obtained the monopoly of granting licenses for the sale of ale and brandy. His book of 1639, De Scriptoribus Hiberniae was to be the last published for fifteen years, due to his involvement in Irish and British politics. Overall, it’s difficult avoiding the conclusion the above history was written by the victors. During the 16th and 17th centuries, England not only conquered Ireland by military force, but under Oliver Cromwell (1649–53) and his forces killed tens of thousands of Irish, and drove hundreds of thousands more off their land in Northeastern Ireland (Ulster). The third hunk of Historic Hubris comes from “independent contemporary sources”. 9. Ochoa, George; Jennifer Hoffman; Tina Tin (2005). Climate: the force that shapes our world and the future of life on earth. Emmaus, PA: Rodale. p. 71. ISBN 1-59486-288-5. 10. Rosen, William (2007). Justinian’s flea: Plague, Empire and the Birth of Europe. London: Jonathan Cape. ISBN 0-224-07369-9. 11. Keys, David Patrick (2000). Catastrophe: an investigation into the origins of the modern world. New York: Ballantine Pub. ISBN 0-345-40876-4. The most quoted independent contemporary source is a Global Warming tome with strong NGO connections that suggests it’s neither independent nor a primary source of information for the “extreme weather events of 535–536”. George Ochoa is a writer specializing in reference books on science and other subjects. Jennifer Hoffman, PhD, is a marine biologist and World Wildlife Fund consultant. Tina Tin, PhD, is a World Wildlife Fund-affiliated climate scientist. Having discovered that the documentary evidence is far from overwhelming the independent observer is left to consider the scientific evidence. Tree ring analysis by dendrochronologist Mike Baillie, of the Queen’s University of Belfast, shows abnormally little growth in Irish oak in 536 and another sharp drop in 542, after a partial recovery. Similar patterns are recorded in tree rings from Sweden and Finland, in California’s Sierra Nevada and in rings from Chilean Fitzroya trees. Ice cores from Greenland and Antarctica show evidence of substantial sulfate deposits in around 533–534 ± 2, which is evidence of an extensive acidic dust veil. Unfortunately, this scientific evidence is also far from overwhelming. Firstly, the “extreme weather events of 535–536” and associated “extensive acidic dust veil” doesn’t materialise as a downward spike in Leona Libby’s trusty Old Japanese Cedar Chronology. Secondly, the “extreme weather events of 535–536” and associated “extensive acidic dust veil” doesn’t materialise as a downward spike in the Irish Oaks Delta 14C Chronology. The best the 1993 Irish Oaks Delta 14C Chronology can muster is an uncalibrated downward spike in 414 AD which is adjusted to 590 AD by the calibration process.. However, all is not lost for the “extreme weather events of 535–536” because there are other secret sauce recipes for the lubricating Consensus Calibration Coulis. This was experimentally verified in the 1980s. Over the next thirty years many calibration curves were published using a variety of methods and statistical approaches. These were superseded by the INTCAL series of curves, beginning with INTCAL98, published in 1998, and updated in 2004, 2009, and, most recently, 2013. The improvements to these curves are based on new data gathered from tree rings, varves, coral, and other studies. The IntCal13 recipe for the Consensus Calibration Coulis is almost the perfect secret sauce for validating the “extreme weather events of 535–536” and associated “extensive acidic dust veil” because an uncalibrated downward spike in 363 AD is adjusted to a more sympathetic 525 AD by the calibration process i.e. only 11 years short of 536 AD. However, before you get too excited it should be noted this Consensus Calibration Coulis recipe has probably doubled up on some of it’s ingredients. If this is the case then the scientific evidence for the “extreme weather events of 535–536” actually relates to 1145 CE. Which, strangely enough, makes sense because 1145 CE coincides with a Comet Halley perihelion. Hopefully, that wasn’t too messy. Gallery | This entry was posted in Astrophysics, Atmospheric Science, Comets, Dendrochronology, Deranged Dating, History, Old Japanese Cedar Tree, Radiocarbon Dating. Bookmark the permalink. Just went through my issues of Skalk (Danish periodical on archeology and history) these days to find any pics of burned earth in Danish excavations of the Viking age; they do exist but more when I’v been through it all – however issue 4/2001 reports findings in Danish dendrochronology and other in the Northern Hemisphere of the Fimbulwinter with lows in 536, 539 and 540 postulating either volcanos eruptions or a comet as the cause and cite roman source of the day and age. However from an acheological aspect the interesting issue is that the wealth of gold seen in prior days ends at this time and the flow of gold from the Roman Empire is dried out. The Migrational Era then set in. I suspect there is still a lot to learn about the flow of gold. A certain tribe was exporting Roman gold by the ton. In the fourteenth century, Petrarch and other Italian humanists discovered manuscripts containing more than 900 letters of which more than 800 were written by Cicero and nearly 100 by others to him. I have been tinkering with a graph from here: https://judithcurry.com/2018/06/28/nature-unbound-ix-21st-century-climate-change/ Fig 122. My primary interest was in the Holocene where the Eddy cycle troughs surprisingly coincided with other material of mine. Looking again on the last 2000 yrs for coincidences, that site/figure 122 had on it marked the Roman Warm period and Medieval warm period as coinciding with peaks. I have no answers as to WHY, or what the Eddy cycle is, or what the coincidences are. But I note the cycle time length points to no additions of bogus years to the history record, ~0 CE to 2000 CE. All appear accounted for in the Eddy cycle. before commenting on that, I watched your video the Mjadnra megalithic calendar and your test of it. Nice. I noticed your diagram had the marking “quadrant with 90 divisions”. Some ancient societies had calendars of 360 days. I was wondering what the error margins are. Would it would have worked if the year only had 360 days then? (I realize there are two theoretical ways this could have been, making this two questions) .. And is there an explanation for the second bit built as much as centuries later? re the Eddy cycle, it’s a pattern in cosmogenic isotopes 14C and 10Be found in various proxies. Considered to be mirroring solar magnetic strength over time. It is ~ 980-year long. Too long for any significant correlation in a mere 2000 years! There is an apparent climate correlation cited in the famous Bond et al (2001), but that is over 10k years, Those ten events of ‘ice-rafted debris’ are not calendar-specific. ASFAIK. I really don’t think the Eddy cycle refutes a claim of phantom years. So someone is watching my works. Tks. First, the explanations given were simplistic, but getting into the finer details would be scary for some, I figured. The method works irrespective, but for accuracy there are adjustments to be made. My setup video camera was a poor thing. The pinhole of 2mm sq had a vertical black thread in middle for accuracy. At first flash – first pinpoint of sunlight – the shadow is very sharp so measurement is far more accurate than was possible in my test (this I saw with earlier model of full apse calendar, and thread shadow fades away quickly). Then again the model is 1/20 scale, so on the real thing it allows even more precision. There is other substantial evidence indicating so but long story here. Re end question (1st para). Calendar has extended surface that changes equinox to solstice angle at sunrise from 18deg to 29deg at latitude 35.8 – an tilt change. Also an inner ‘camera obscura’ that enables this new angle to be measure more accurately – a later mod. Indicative date is 2345bce (from Dodwell, tree-rings, C/N ratio iceland; C14….). However my first guesstimate was earlier, and then finding a C14 disturbance at ~2800 made me think. But ?? Re second para, thanks for the info for source of Eddy. There is one thing here, Eddy cycle appears in effect over long times. See : https://melitamegalithic.wordpress.com/2018/07/24/searching-evidence-update/ If there are phantom years in one section there would be in other sections as well. Its like a metronome; whatever the beat length, all beats are of equal length. If the beat length is known for the past 980 years, then we know it is same for earlier.